News of Hurricane Sandy’s projected landfall gives New Yorkers little time to prepare, but whatever the mysteries of nature, certain New Yorkers, the poor, and working class, mostly members of oppressed nationalities, mostly the women among them, know one thing for sure: the deck is stacked against them. With a child debilitated by a serious handicap, Evelyn is a mother whose partly-natural and partly-curated disposition is to confront and solve any problem that comes her way. Faced with an acute scarcity of resources, that inclination meets with a sharp rebuke. It comes, like a weather system of its own, in waves, and inhabited by people close to her, each of who harbors a pressing need that comes petitioning in advance of nature’s certain storm. They may or may not intend to throw Evelyn off her course, but their own force of nature is irrepressible: they would have her shelter in place to host the storm brewing in their lives. Evelyn is the Puerto Rican mother who parries her optimism and survival skills against an onslaught aided and abetted by injustices that drop deciduously and predictably on certain communities but not others: more so when high winds and a downpour coalesce. 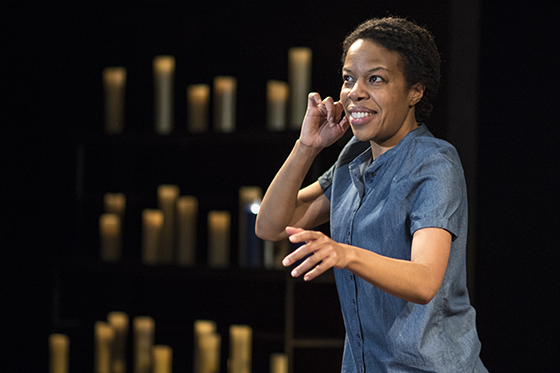 For seventy-seven minutes, Nilaja Sun will beam up a constellation of characters she created and wrote. They are members of one family, and include Evelyn’s physically impaired daughter Candace, and brother Manny, who comes back from the war in Afghanistan with a bill of particulars for redress. He carries his own personalized collection of wounds that need attention. There is an elderly grandfather, more a human time capsule than a relic from the past. None of the pieces in this sharp-edged jig-saw puzzle, micro-planed by humor, fit together neatly into a transportable unit that can be evacuated, tended to, and saved from certain loss, without Evelyn living not only living her life, but the lives of others in her life. In fact, Sun is not only Evelyn, but also the others in Evelyn’s life. I wonder about the Berkeley Rep audience. Though it includes a sizeable number of people of color, it is by and large, upper middle class in its composition. Will this be just another story about how the other half lives that plays on the guilt of class privilege, or will there be a universal gravitational pull? Sun believes that her role is to tell the story. She insists that the theater’s role is to carry out due diligence in scaling the price of tickets so that the performance is affordable for all interested parties. “It is uncomfortable to have your work shown in a theater where the wealthy occupy the front of the house, and those without deep pockets are consigned to the back rows,” says Sun. The same applies to ADA seating. “Are all the ADA seats in the rear or on the sides of the house?” she asks. That kind of arrangement can speak louder than the show’s production values and become a subversive subtext. She often sees theaters where such logistics are left to the discretion of young, inexperienced interns, whose focus is not yet trained on the big picture. Ultimately, Sun wants to generate an educated, intentional optimism wherever she takes her work. At the show’s end, she would like each audience member to rise from his or her seat, realizing how possible it is to simply get up and walk out, to willfully use his or her body, unassisted. She wants that consciousness to extend to coming to the aid of fellow human beings, particularly returning PTSD-impacted veterans who carry physical and emotional damage. Without a means to express that anti-social anger, mass shootings, such as the recent one at the Thousand Oaks bar, fill the vacuum. Instead of focusing on the guns the shooter brings to the bar, and blaming it all on Trump, Sun would advise us to take a good look at a 30-year war with no social purpose or foreseeable end, that drives a ruined soul to destroy whoever happens to be hanging out in a nearby campus bar. Rather than viewing this layer of demoralized veterans as a basket of marginalized deplorables, Sun hopes that we will see them as we do ourselves, see them as us, and help each other get to where we and they want to go in life.